KITsubs: Let's Go Kamen Riders! Net Movies 31 - 40! 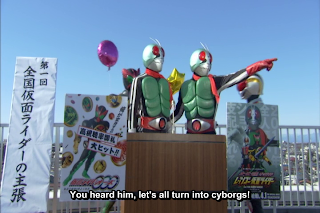 Let's Go Kamen Riders! Net Movies 31 - 40! We're finally getting ready to call this project done... only a few more episodes to go! There are a lot of funny episodes this time around. Whether it's Den-O Wing Form's foppish mincing, or Rider 1's rant on what makes a real Rider, or Stronger yelling at peppers. And as of tomorrow, we'll officially be done. We're releasing the last batch tomorrow night, along with a torrent for the entire series. It will be our first torrent release, so we hope that it introduces new fans to our group! Also, there was a typo in the mkv version of episode 37, Kiva's episode. This is the corrected episode by itself. Also, the script, if you wish to fix it for yourself. Otherwise, we'll include the corrected version in tomorrow's torrent. There were a lot of typos. I'm sorry! The links have changed to v2's now, with all of the errors corrected. Kamen Rider Skyrider Episode 18! Kamen Rider Skyrider Episode 17! Kamen Rider Skyrider Episode 16! Let's Go Kamen Riders! Net Movies 21 - 30!